(Nanowerk News) Solar energy conversion of water into H2 through photocatalysis is envisaged to be an attractive approach for H2 production. However, the separation efficiency of charge carriers is the key to improve the efficiency of photocatalytic hydrogen production. 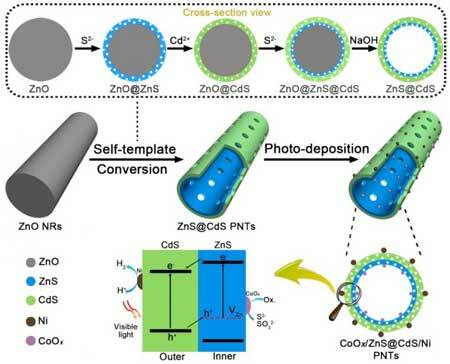 A recent study reveals that the double-layered porous nanotubes with spatially separated photoredox surfaces were synthesized by self-template strategy and showed enhanced photocatalytic activity toward hydrogen production. The paper was reported in Science Bulletin ("elf-template synthesis of double-layered porous nanotubes with spatially separated photoredox surfaces for efficient photocatalytic hydrogen production") by Prof. Bin Zhang from Tianjin University. The authors synthesized [email protected] double layered porous nanotubes with spatially separated photoredox surfaces, which were realized by using ZnO nanorods (NRs) as templates through sequentially interfacial anion/cation exchange reactions and template etching. The photo-reduction deposition of Ni nanoparticles and photo-oxidation deposition of CoOx nanoparticles were distributed on the outer surface and inner surface of [email protected] shell, respectively, suggesting the spatially separated photoredox reaction sites in [email protected] double-layered shell, achieving highly enhanced photocatalytic activity. With the outbreak of the energy crisis in recent years, the development of new energy is highly important. Solar energy conversion of water into H2 through photocatalysis is envisaged to be an attractive approach for H2 production. However, the separation efficiency of charge carriers is the key to improve the efficiency of photocatalytic hydrogen production. Loading cocatalysts is an effective strategy to promote charge separation and create surface redox reaction sites. However, in most cases, the randomly distributed cocatalysts on the surface of photocatalysts resulted in a random flow direction of photogenerated charge carriers with a high recombination probability. The rational design of hollow-nanostructured photocatalysts, with spatially separated photo-reduction and photo-oxidation reaction sites on different surfaces (inner or outer surfaces), respectively, is a promising strategy. Nevertheless, these photocatalysts are always restricted to hollow spheres with close-ended structure which increased the mass diffusion resistance, and the high-cost of Pt nanoparticles used as the electron collector limits their practical application. Herein, the Zhang group reported a self-template strategy for rationally designed synthesis of double-layered [email protected] porous nanotubes (PNTs) with open-ended structure. The fabricating of thin heterostructure endows the photocatalysts with spatially separated reduction and oxidation reaction surfaces. The mesoporous wall and macroporous cavity in the as-converted products allow the visible light penetration and multiple reflections inside the cavity. for efficient utilization of solar irradiation. The existence of Zn vacancies (VZn) in the inner ZnS layer states energy can act as acceptors of holes from CdS. And the conduction band (CB) of CdS is below the CB of ZnS, which can induce the enrichment of photogenerated electrons in the outer CdS layer. After selective photo-deposition of Ni and CoOx as dual cocatalysts, Ni nanoparticles as electron collectors and reduction reaction sites are loaded on the outer shell, while CoOx nanoparticles as hole collectors and oxidation reaction sites are loaded on the inner shell. As a result, a novel CoOx/[email protected]/Ni photocatalyst was obtained and showed high visible-light-driven photocatalytic hydrogen production activity owing to the synergistic effect of self-template-derived thin mesoporous heterojunctions and photo-deposition-derived spatially separated dual cocatalysts, which can significantly provide driving force for the ordered transfer of photogenerated electrons and holes toward opposite direction and promote the surface catalytic reaction.